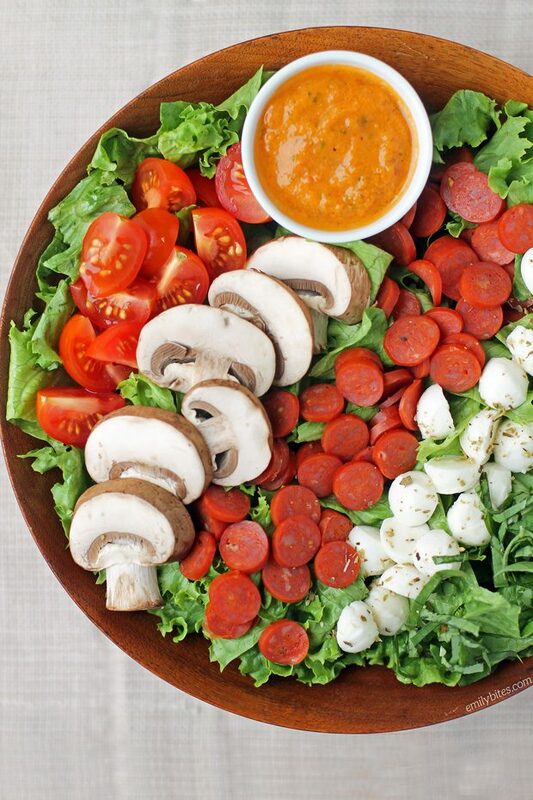 This Pepperoni Pizza Salad with Tomato Vinaigrette is perfect for lunches. When the weather warms up I find myself wanting salad for lunch and this one is super satisfying. I thought it would be fun to put some of my favorite pizza flavors (pepperoni, fresh mozzarella, basil, tomatoes, mushrooms) into a salad and toss it in a tomato basil dressing. Not only is this salad delicious and healthy, it’s also super easy to customize with your own favorite pizza toppings! I intentionally left it pretty basic, but you can add croutons if you like a little crunch (so good – like pizza crust! ), or toppings like olives or peppers if you prefer. Don’t like mushrooms? Replace them with something you love! Easy Peasy. I love how easy this salad is to toss together and I especially love that it’s tasty and filling for just 289 calories or 6 Weight Watchers SmartPoints! The tomato vinaigrette is fresh and flavorful and it pairs perfectly with the pizza toppings. This salad also travels well if you want to pack it to bring to work for lunch. Just put the dressing in a separate container and you’re good to go! For more light and tasty salad recipes, check out my Asian Sesame Chicken Salad, Roasted Beet Salad, Broccoli Salad, Avocado Bacon Corn Panzanella Salad, Butternut Squash Quinoa Salad, Antipasto Salad, Harvest Apple Salad, Doritos Taco Salad, Greek Orzo Pasta Salad, Chicken Souvlaki Salad and many more in the salad section of my recipe index! Other optional ingredients (not included in nutrition calculations): croutons (to get that pizza crust crunch! ), black olives, bell peppers, any pizza toppings you like! In a blender (or a cup if using an immersion blender), combine the plum tomato, olive oil, vinegar, pizza sauce, 1 tablespoon of the basil, garlic, oregano, salt and pepper. Blend until smooth. 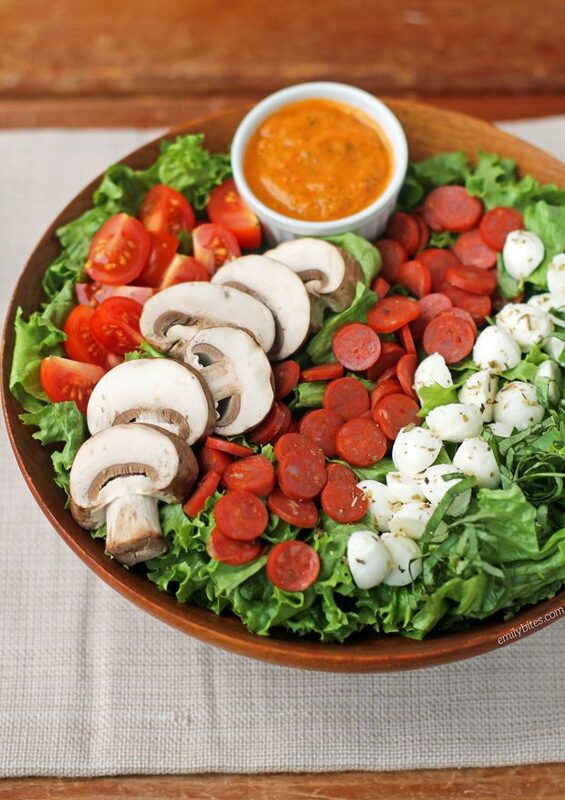 *To build each salad, place 3 cups of lettuce into a bowl and add 1 oz of pepperoni, 1 oz of mozzarella, 1 oz of mushrooms, 3 cherry tomatoes and 1 tablespoon of chopped basil. Drizzle the salad with two tablespoons of the dressing made in step one. *Build each salad to serve! If you’re only serving one or two salads, dress the ones you’re serving and store the components separately and the remaining dressing in an airtight container in the fridge.